The Yetter 2987 Magnum coulter is a necessity for spring, fall, and side dress fertilizer application. An all-star in the line-up of Yetter fertilizer equipment, the Magnum gives growers the ability to increase productivity with more acre coverage per day, faster application rates, and minimal soil disruption. The Yetter Magnum features a single disc design that gives this coulter a lower draft requirement than conventional fertilizer equipment. The Magnum requires less fuel and horsepower during operation. Yetter fertilizer equipment field testing indicates that the Magnum applies fertilizer at speeds of up to 10 miles per hour. The Magnum’s design includes a 22-inch blade that cuts through the soil surface, with the coulter set at a 5% angle. 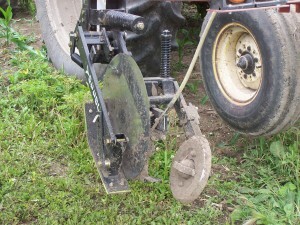 An optional fertilizer knife can be used for liquid, anhydrous or dry fertilizer application. The fertilizer knife is self-adjusting, with an extended wear carbide tip floating scraper. 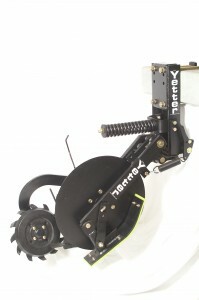 The slot opened by the blade and knife is closed and sealed by a spring-loaded cast-closing wheel. Application depth of the Yetter Magnum can range from 4 to 6 inches, and is controlled through the adjustment of the toolbar height. Minimal soil disturbance is a key advantage the Yetter Magnum offers over other types of fertilizer equipment. The benefits of less soil disturbance include better ground cover, less weed germination, and less chance for erosion. Ohio Valley Ag is proud to feature Yetter fertilizer equipment. The Yetter 2987 Magnum coulter is the best choice for increased productivity with low soil disturbance, faster application rates, as well as early side dressing and planting without an extra pass.